Dear Readers, I have a treat for you today. 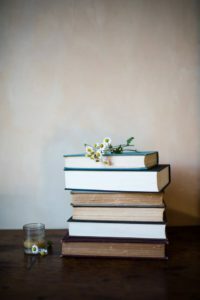 Not only am I sharing a sneak peek recipe from Mickey Trescott and Angie Alt’s new (and totes amazing) book, The Autoimmune Wellness Handbook, I am also sharing a few thoughts on being empowered, recognizing the “savvy patient,” and, well, having fun — directly from these AIP mavens who so kindly agreed to be interviewed for the blog. But first…a bit about The Autoimmune Wellness Handbook. Here’s the thing — it’s never just one thing. 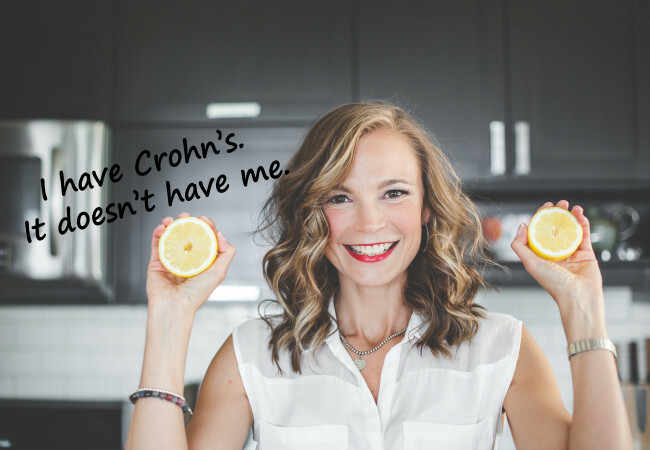 I’ve been confronting autoimmunity for decades after a diagnosis of Crohn’s Disease as a teenager. And for many of those years I struggled. A lot. Fortunately, my family turned to food as medicine almost immediately after my diagnosis, but pieces in my healing journey were missing. I didn’t understand the import and impact of lifestyle factors like prioritizing sleep, participating in the right kind of movement, and staying on top of stress management. 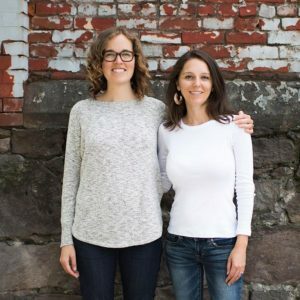 Mickey and Angie’s book focuses on the whole-body and whole-life approach necessary to living well with chronic illness. And this is precisely what makes this book so SO special and pertinent. Because, again, healing is never just about one thing. 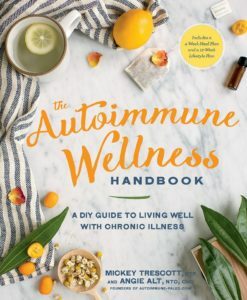 Mickey and Angie have done a stellar job at creating a resource that will improve the wellbeing of millions challenged by autoimmune diseases. 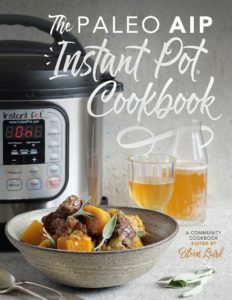 Of course, nourishing one’s self with real food is a fundamental part of the healing journey, so it’s only fitting that I share one of the delicious recipes the book contains (with the authors’ permission, of course). 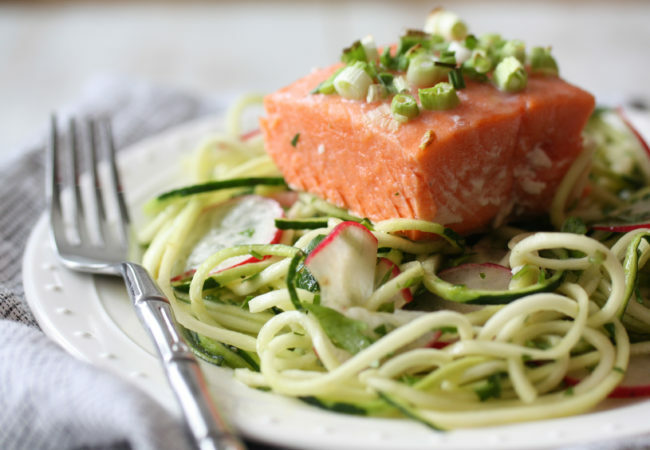 So scroll on down for the deets on the scrumptious Cold “Noodle” and Salmon Salad. But, now, let’s have a chat with Mickey and Angie themselves! I asked each of them three questions, and I know you’ll value and enjoy their responses. Your message is one of empowerment and self-discovery. At what moment(s) did you feel most empowered? Mickey: Due to my previous long-term vegan diet, I suffered serious anemia that would not resolve with any type or dose of supplementation. When I transitioned to Paleo, and eventually the Autoimmune Protocol, and started including both red meat, and especially organ meat like liver, my iron levels skyrocketed so quickly that my doctors were stunned. That was one of the moments that confirmed my intuition that educating myself and trying something that was maybe unconventional would pay off with big health wins. Angie: I’ve had some pretty empowered moments, but I think my earliest one was about three days into beginning the Autoimmune Protocol. I had been suffering with increasingly severe anxiety attacks for a few years. I white-knuckled it through most days and jolted awake drenched in sweat, sure I was dying, most nights. Eventually I gave in to all the doctors urging me to use a small dose anti-anxiety medication, which didn’t actually offer much relief. I knew that there was a physical issue underlying the symptoms, but I didn’t yet understand the role nutrients played in emotional and mental stability. Around the third day of eating a nutrient-focused AIP diet, the intense panic just melted away. I knew right then that what I’d discovered in just three days of feeding myself differently was going to change my life. What three characteristics come to mind when you think of the “savvy patient”? Mickey: To me, savvy patients are informed, but don’t think they know more than their doctor. If anything, they are respectful of their knowledge and training and are ready to glean as much insight from them as possible, so that they can make the best decisions for their health. Second, savvy patients are those who understand a combination of conventional, natural, and DIY approaches are often necessary to live well with autoimmune disease, and they flow between the three as needed. Lastly, savvy patients understand that they are the authority on their own bodies, and that ultimately they have the final say on any health-related decision. Angie: When I think of “savvy patient,” I think of someone who has taken time to educate themselves thoroughly on their disease with the goal to use that information to get “high mileage,” asking intelligent questions that require thoughtful answers from their doctors. I also think of someone who isn’t afraid of personal responsibility in their healthcare. He or she has taken on the challenges of using a combination of approaches to tailor a wellness plan. Finally, I think of someone who isn’t satisfied to give his or her power to “gurus” and instead recognizes the only true expert on one’s body is one’s self. Now that you’ve achieved maintenance in your healing journey and enjoy full lives, what are your favourite fun things to do? Mickey: My favourite thing to do is ride horses again! I grew up riding extensively, and at one point I wanted to be a horse trainer and go to the Olympics for hose jumping. I quit to go to college and got sick shortly after, and before I knew it, I hadn’t ridden regularly in over a decade. Very recently I noticed I was strong enough to ride again and adopted a project horse named Bear, who I adore. Angie: I like hanging out with my husband and daughter. I had quite a few years that didn’t include many smiles, let alone genuine laughter, and so we spend some pretty serious quality time laughing together (my sense of humor is pretty sharp thanks to AI disease!). I also get together, as often as possible, with local friends and friends from all over the world who we’ve met in our travels. Sometimes that means informal dinner parties, sometimes that means special trips. I think I feel grateful for those connections in a deeper way now, and I try to give them a level of attention that reflects gratitude. Thank you, Mickey and Angie, for those wise and meaningful words. And thank you for your hard work in this community. I am not exaggerating when I say The Autoimmune Wellness Handbook will change lives. This book is that powerful and that significant. Place the salmon, skin-side down, on a baking sheet and season with the sea salt. Top with the green onions. Bake for 15 minutes, depending on the thickness of the fillet. To tell if it is finished, its flesh should no longer be translucent, and it should flake with a fork. 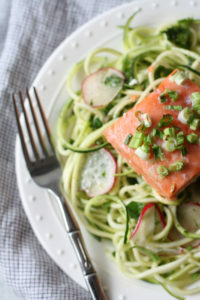 While the salmon is baking, "spiralize" the zucchini using a spiralizer tool or a vegetable peeler to make long ribbons. Place in a large bowl and add the radishes. 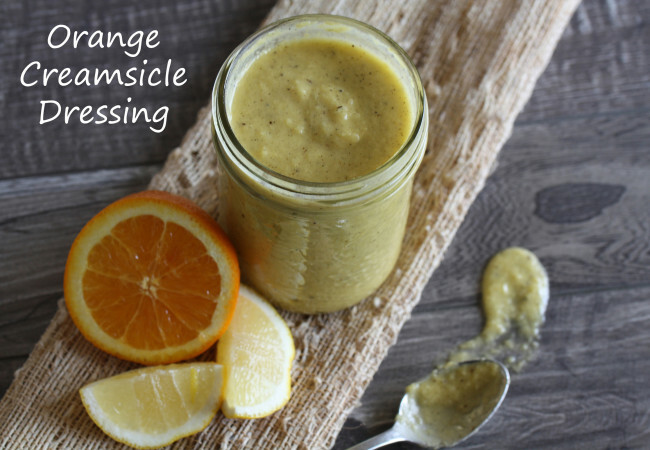 Place all of the dressing ingredients in a jar, close the lid tightly, and shake to combine. 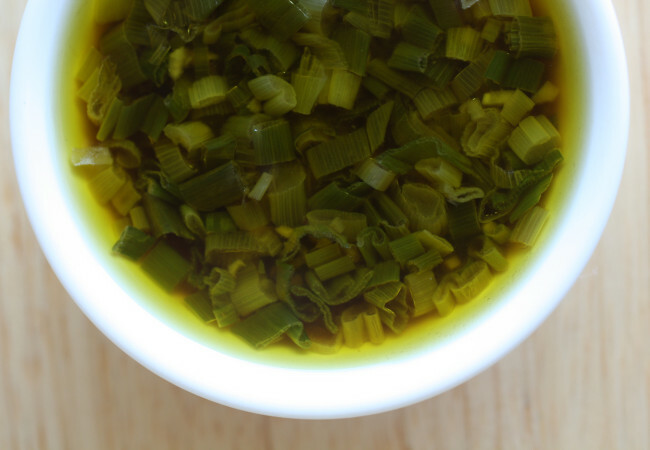 Pour the dressing over the zucchini salad and toss to combine. Serve the salad topped with the salmon. Keeps for 2 to 3 days; store dressing separately.